The beauty of your home is not only seen from the outside. In fact, the interior is as important as the exterior. It’s true that some of your visitors and passersby can only appreciate the beauty of your home from the outside, but how about the ones that have the privilege of coming in? This shows that you should use the same effort to design both the outside and inside of your home. So what do you refer to as an interior design? Is it just to paint your home with the most colorful paints? Of course, paints do a marvelous job when it comes to beautifying a home, but there are other means by which you can improve the beauty of your home. Apart from paints and wall designs, the first set of items that can also pull attention are your furniture. If you have a wonderful set of chairs in your sitting room which align seamlessly with your wall designs, your visitors will definitely be amazed at the beauty of your home. Furniture designed for certain activities can also pull attention, especially if it is one that is not very popular. In this post, we are going to discuss some of the furniture that can make the interior of your home look smart. I hope you will come to love every one of them. Let’s, first of all, take a look at some smart interior decoration tips. If you are looking to convert your home into a small empire, you need some ideas to push your vision forward. You don’t just go pick up any wall paint, or to purchase any furniture without carrying out a proper assessment. You could turn your home into a war zone, rather than the empire which you so much wanted. Here are some tips to help with your smart interior decoration. There is no better way to explain this phrase. You just need to make it simple if you live in a small apartment. Mixing all sorts of colors in a bid to make your apartment colorful could easily go the wrong way. This is because a wrong color or poor design will immediately expose itself to your visitors the moment they step their foot into your home. It’s the same idea for furniture. Wanting to feel like a badass tech geek in a small room is not advisable. You want to have a gaming desk, a reclining chair, a standing desk, and other nice looking furniture in your small home. You will simply end up making your home look tighter than it should normally be. So for a small room, just keep it simple. You’ve definitely got to explore your space if you live in a large apartment. Unfortunately, some people are unable to do this. They would rather concentrate the designs on their sitting room than at other areas of the apartment. In the same vein, they will rather choke up the living room with their tech furniture and accessories, rather than spread them across the home. Fair enough, your sitting room should have the most attractive colors and design, but the other areas of your apartment should not be afar off. Similarly, only essential furniture is needed in your sitting room. If there is anything you don’t use frequently, you should consider relocating it. You can buy as much furniture and equipment as possible, but work out the space where you will be installing them before going ahead with the purchase. Do not abandon your kitchen when beautifying your home. We are not saying that you should use excess color mixture when painting it, but at least, it needs blend with the other parts of your house. A lot of people are of the opinion that the kitchen doesn’t really need to be designed because it is the least visited place by visitors. Fine! You may be right. However, that is not enough reason to abandon it. You can make the design simple. Another way to beautify your kitchen apart from wall painting and design is to keep everything well-arranged. If you need to buy a rack to keep your plates properly arranged, then go ahead and buy it. If you need a pot rack to keep your pots properly arranged, go ahead and purchase one. Whatever you can think of to keep everything in your kitchen organized is worth purchasing. The reason is that, after cooking or washing, you know where the dishes, spoons, pots are supposed to be returned to. As such, you won’t have them flying around in the wrong places. It all contributes to smart interior décor for your home. There is no point in having the most beautiful home in your estate when you can’t care for it. It is not only about using the most attractive paints, the most expensive gadgets, or adopting the best and optimum arrangement. You need to have specific dates or days when you carry out cleaning and routine checks around your home to ensure everything is in good working order. This is how you’ll get to know that one or two gadgets are beginning to develop faults and would need to be worked on. Or a particular furniture is in a moist location and would need to be taken somewhere better to preserve its life. You basically get the latest impressions about your home and can respond quickly to make everything continue running smoothly. You will also know when to take out a few redundant gadgets, or to put some new ones in place. Getting an expert is probably your best option if you are not good at putting things together attractively. An expert has probably designed uncountable homes and already have the picture of what a new home should look like in his/her head. They step into your home and already have the finished product in their head. This can save you a great deal of time; but again, how about the cost? Can you afford to pay for their services? Well, if not, you simply need to create time, follow the ideas in this post, get some more knowledge from the internet, learn how to intermix colors, and learn how to arrange things properly. Yet again, if you can afford to spend so much to purchase the items needed to beautify your home, then there is every chance that you can afford to hire an interior décor expert. Remember, it is a onetime payment which may not cost up to 1/10th of all the expenses on your home. You can have them come carry out the scheduled maintenance as well, but that would incur more costs. If you’ve got some spare time, do it yourself. This section is for those who have done their wall paintings and decoration. It can be difficult at times to know the next step, let alone take it. Hopefully, the ideas we are going to share here will help you see some of the things you need, and go for it. If you haven’t already purchased a desk for your home, you need to try out this particular one. The years have gone past purchasing ancient desks that have no significant features except to put items on it. Just as every other gadget continue to embrace technology, even ordinary desk, so to say, have joined in the revolution. With a smart desk, you can achieve more than you normally would with the conventional ones. Amongst other features, the one you will enjoy most is the ability to adjust its height. Working from a standing desk and an office chair for a long period of time causes fatigue in various areas of your body, especially your back. You can avoid all those aches with a smart desk. Its attractiveness is also something that will blend seamlessly with your home design. Just as a smart desk beautifies your home and increases your efficiency at the same time, so does an ergonomic reclining chair. If you can achieve a lot with the smart desk, you can achieve even more with a reclining desk. It allows you convert the chair into any position that is comfortable for you. This effectively reduces or eliminates all forms of aches that could be building at various areas of your body. The design is also something that would blend seamlessly with your home’s interior décor. The chair comes in a few available colors giving you the option of choosing the best color for your home. Apart from all you can do with this Ergochair, it is built to last. You therefore would have no reason to replace it for many years. Stools are not seen by some as a basic necessity in a home, but believe me, there are times when you will need them. I’m not talking about the old bogus stools, nor the recent ones which come in an all-glass design. I am talking about a smart stool which does more of the job of a regular stool, and also injects its beauty into your home. The Ergostool is a product which you should definitely consider adding to your smart interior design. It is a luxury stool which comes with height adjustment, a soft and comfortable cushion, and a base which makes it able for you to take up certain sitting angles. It can replace your Ergochair if you think you need something that will make you sit more upright when working. The stool is beautiful and will definitely improve your interior decoration. This is another product you need to consider having at your home. The anti-fatigue mat helps you stand on a more comfortable surface than the hard floor. This comes in handy when you are already feeling aches from sitting long hours. 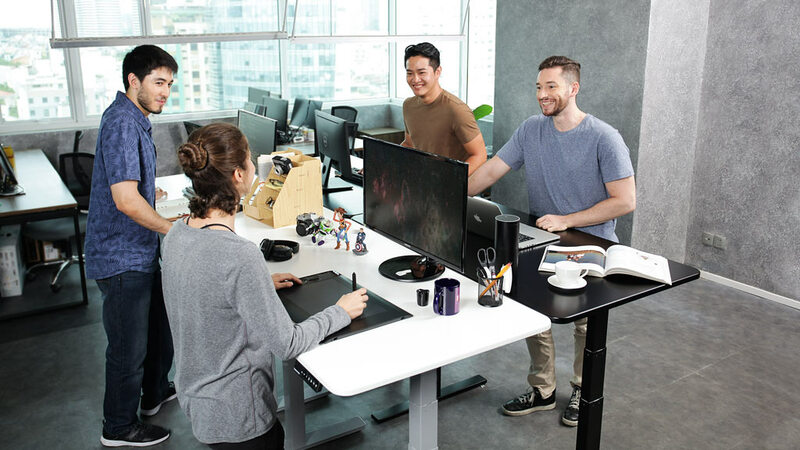 Combining this amazing product with the smart desk already discussed above will make you feel more at ease when working from home. The mat is designed with a 2inch incline to help you stand more comfortably. It is also scientifically proven to improve your posture and relieve you of back pains. If you want to have a smart home and work smart from there, you definitely need this product. Having a smart home has a lot to do with how well you can keep things organized. Cables are stuffs that can easily cause your home to look unpleasant. You can have the most beautiful home; but with cables flying here and there, attention could easily be shifted away from your interior décor. Keep a smart home by managing all cables properly and using a cable tray where necessary. This cable tray is designed to fit into certain desks so before you order for one, ensure that you have the appropriate desk for it. Apart from just cables, keeping all irrelevant kinds of stuff hidden will help radiate more of the beauty of your smart home. If you really want to build a small empire with your home using smart interior decorations, you definitely need to read this blog post over and over again. In summary, you need to start from the walls of your home. You need not just the best paints and wall decors, you also need the best ideas on how to intermix the colors and wallpapers. We discussed hiring an expert. Go ahead and do so if you can afford it. After setting up the walls and basic designs of your home, you need to choose the best gadgets to complete your smart interior décor. For this, we highlighted 5 gadgets which are essential for making your home smart. These gadgets can be very useful if you work from home. They also help make your dream of a smart home come to life.